"It was nice having a job supervisor on job. Adam was very..."
"Very efficient and professional. Great crew covered items..."
These homeowners had a roof that was very worn and needed to be replaced. Our crew removed the damaged shingles and installed all new durable asphalt shingles. The homeowners love the curb appeal and the protection that their new roof provides! Birds are terrorizing wife by coming in through vent on roof, would like screen replaced on vent. Wind damage to shingles on roof. 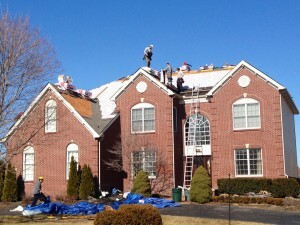 With over 15 years of experience providing quality roofing services in Clinton Township and nearby, Coverall Roofing are your dependable experts for roof repair and roof replacement. If your home's roof has suffered storm damage, has started leaking when it rains or if you suspect your roof is worn out and putting your home at risk, we can help! Coverall Roofing provides the highest quality roofing materials and services. We work with products from industry-leading manufacturers, ensuring every home we work on gets the best shingles available. Our roofing professionals always put the customer first, taking the time to communicate at every stage of a repair or roof installation. For many homeowners, their roof is "out of sight, out of mind" until there's a significant problem. But little roof problems generally get worse over time. Because your roof protects the inside of your home against the elements, we believe in maintaining your roof in tiptop condition. We recommend having your roof inspected regularly or after a bad storm season. Eventually, a roof replacement may be in order and when that time comes, we can provide an effective, quality roof replacement that meets your needs and budget. We install high-quality asphalt shingle roofs that will provide long-term protection and add beauty to your home. Call Coverall Roofing today to get quality roof repair, roof replacement, or siding replacement for your home in Clinton Township. We offer free estimates on all our work! Getting a chilly start this morning with temperatures around 50 degrees in Clinton Township. Do you notice any of your shingles starting to peel back? Coverall has you covered! Call today to have a professional assess any potential damages.